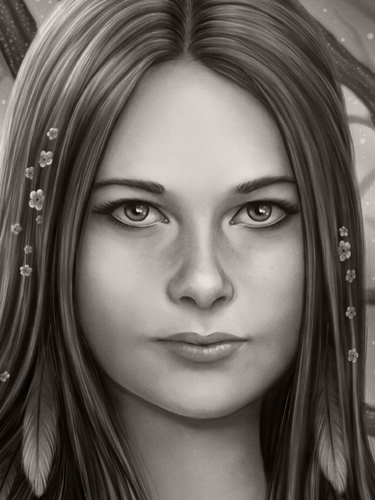 This is a personal project I started on last year and it is a portrait of my mother when she was young. She told me this story about when she was a child and walked home from school, a jackdaw would fly down to sit on her shoulder.. or something like that atleast. Can't fully remember the details but it was something I wanted to illustrate for a long time. 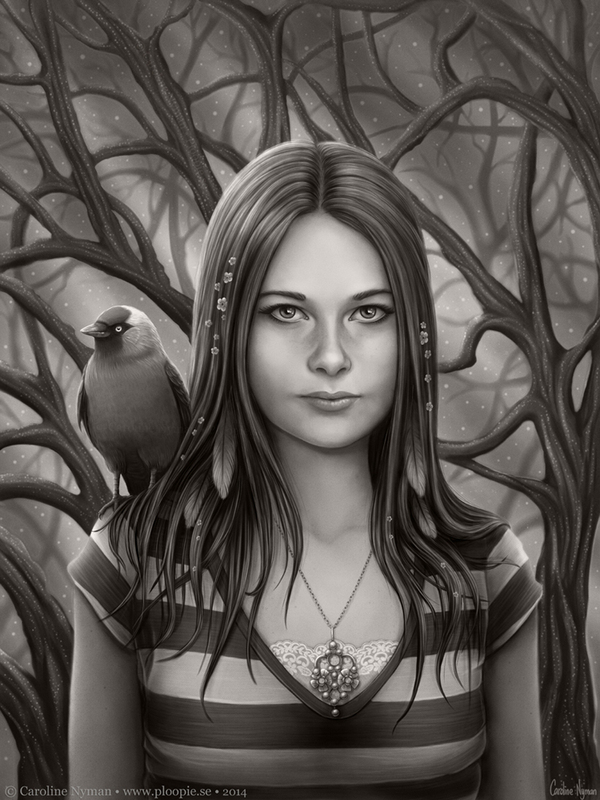 I had different ideas, first I sketched down a little girl walking on a road with a jackdaw on her shoulder, then a teenager girl under a tree with the bird sitting next to her on a gramophone.. but ended up with a simple portrait. 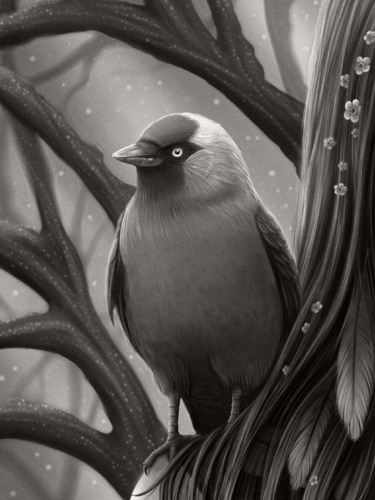 I was also feeling inspired by a fellow artist friend named Christina Lank, that paint beautiful portraits with birds in them, and I wanted to try to do something similar. It was planned to be in colours but somehow I got lost in the black and white world. I tried to colour it afterwards but I didn't manage to make the colours look good so I decided to stick with the greyscaled version. I was really not in the mood to learn how to colour a black and white painting or to repaint the whole thing. I better focus on painting something new in colour instead, moving on! At first this was just something I wanted to practise on, play around with and I didn't plan to show it to anyone else, but after working on it for so long I felt that it would have been a shame if I didn't share it with the people who actually enjoy my artworks. And I didn't really play around with it anyway, even though I had Let It Go from Frozen on repeat in my head..
Something I really need to work on, to let it go, just have fun with my paintings and not worry so much about how others will think of it. I still need to find who I am when it comes to creating. It is hard.. I'm open for constructive criticism so if you have something on your mind you think I should know, please share, I want all the help you can give me. Here are some close ups so you can see the details better. 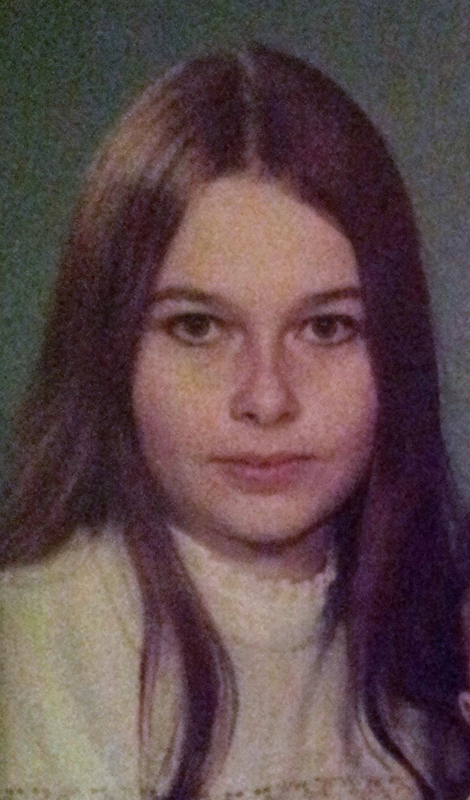 Here you can see the original photo of my mother that I used as a reference.